Teens, Smartphones & Texting | Pew Research Center's Internet & American Life Project: Teens are fervent communicators. Straddling childhood and adulthood, they communicate frequently with a variety of important people in their lives: friends and peers, parents, teachers, coaches, bosses, and a myriad of other adults and institutions. This report examines the tools teens use to communicate, with a particular focus on mobile devices, and then places the use of those tools in the broader context of how teens choose to communicate with people in their lives. 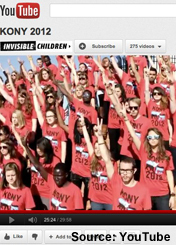 The 30-minute video released last week by the San Diego-based group Invisible Children calling for action against Ugandan warlord Joseph Kony provided striking evidence that young adults and their elders at times have different news agendas and learn about news in different ways. Those ages 18-29 were much more likely than older adults to have heard a lot about the “Kony 2012” video and to have learned about it through social media than traditional news sources. Indeed, a special analysis of posts in Twitter showed that it was by far the top story on the platform. Younger adults were also more than twice as likely as older adults to have watched the video itself on YouTube or Vimeo. As of March 13, the video had been viewed more than 76 million times on YouTube and 16 million times on Vimeo, making it one of the most viewed videos of all time on those sites. A new Pew Research Center report, based on polling and social media content analysis, tracks how the “Kony 2012” video and information about it reached so many Americans in a relatively short period of time, and the critical role social media played, especially for adults under age 30. Efforts to Deal With Bullying | The Diane Rehm Show from WAMU and NPR: An estimated one in six children and teenagers will be bullied this year. A new documentary highlights how bullying can trigger a cycle of violence. Diane speaks to the director of the film "Bully," one of the teenagers who appears in the film, along with a panel of experts. INFOGRAPHIC: Teens and Texting Are The New Milk and Cookies | Mobile Marketing Watch: Teens and texting have become a synonymous pair. Like milk and cookies and peanut butter and jelly, it’s almost impossible to find a teen today who isn’t tethered to his or her mobile device. To illustrate this powerful and increasingly common relationship, OnlineSchools.com published an informative new infographic highlighting the incredible frequency with which today’s teens text.